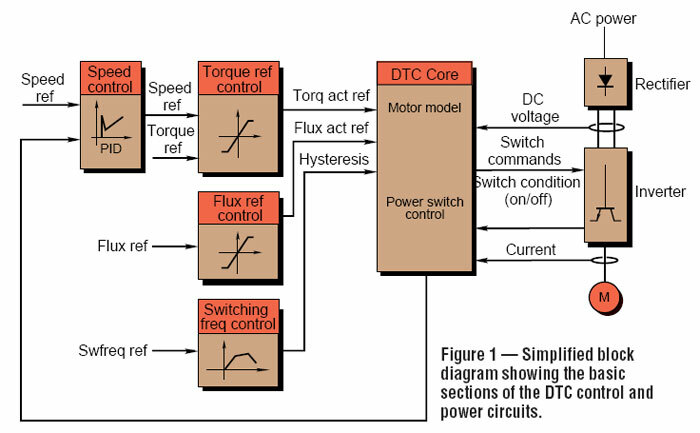 Home » FAQ » How DTC drives work? For many variable speed applications, it is necessary to mount a tachometer, encoder, or resolver on the motor to produce a signal that is proportional to motor speed. Used as a speed feed back, this signal enables an ac drive to maintain the motor speed often within ± 0.01% of the commanded speed and to produce rated torque at or near zero speed. Eliminate the need for any speed feed-back device yet maintain speed within ± 0.5% or better. Deliver rated torque at stall. Provide smooth motor operation as it reverses through zero speed while delivering full torque. According to ABB's Vice President, Standard Drives, Bob Eisenbrown, their engineers in Helsinki succeeded. While announcing this technological advancement, they emphasized that it took 100 man-years of research and three major advances - expanded motor modeling capabilities, advanced power unit control techniques, and the signal processing power to handle complex calculations. All are contained in the ABB drives technology - Direct Torque Control (DTC) - which can be operated as a speed or torque regulator. The basic algorithm of the speed controller is PID. Here is briefly how it works and what it will offer. After wiring is complete, and before the motor is connected to the load, the operator will enter the motor nameplate information into the ac drive memory. For some applications, this is sufficient. For others requiring higher performance, the ac drive can make an automatic identification run, which takes about 1-minute. During this, the ac drive runs the motor through a motion sequence to establish specific motor parameters, which are stored in a mathematical model of the motor. The motor parameters are stored in a flash memory so the information is retained even when power is removed from the controller. During working process, the model receives instantaneous motor current and dc bus voltage values plus the state of the power switches (conducting or not-conducting). The model then calculates the stator flux, torque, frequency, and speed for every control cycle. There is a cycle every 25 μsec (40,000 cycles per second). In addition, the model estimates the stator resistance. This value is based on the initial value obtained during the identification run and on subsequent motor duty. Digital signal processors (DSPs) combined with application specific integrated circuit (ASIC) technology make specific calculations rather than carry out instructions as do microprocessors. In fact, these relatively new technological advances are critical to making the new DTC drive technology a reality. By using 40-MHz DSPs, the control circuit starts to react to a change in 25 msec. This gives a torque loop response of 300 msec to 5 msec, depending on the magnitude of the needed change. To put these values in perspective, Mr. Eisenbrown relates: "DTC's response times (without an encoder or tachometer for feedback) of 300 msec to 5 msec compares to 20 msec for other high-performance vector drives fitted with encoders, and to the typical 150 msec for the newer sensorless flux-vector technology." In graphic form, Figure 2 shows how fast two drive types respond to an instantaneous 100% load change. The two types: a typical PWM (V/f) drive and a new drive incorporating DTC technology. 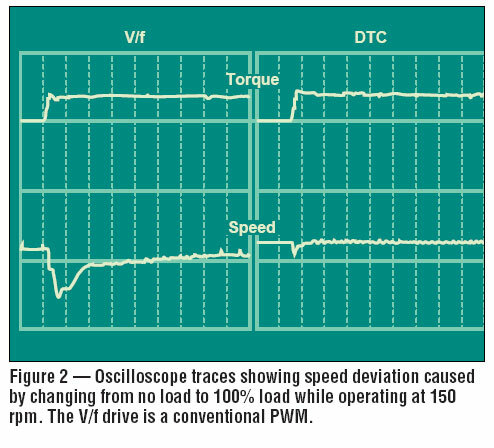 The speed of the PWM drive drops over 60% while the DTC drive speed decreases about 12%. The DTC power circuit Figure 3, closely resembles the circuit of a PWM drive. Both have a diode rectifier front end and six power control devices in the inverter section to change dc to controlled ac. 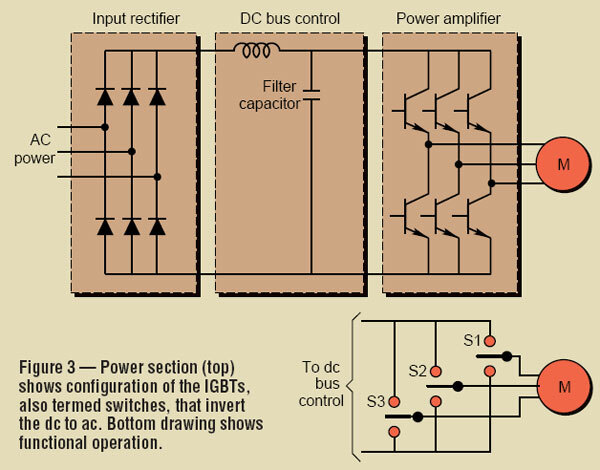 Frequently termed switches, these devices are often insulated gate bipolar transistors (IGBTs). DTC drives will use IGBTs in drives rated to about 400 hp, and gate-turn-off devices (GTOs) in larger ratings. For these larger units, the switching frequency will be in the 800-Hz range. Operating open loop eliminates the need for a motor mounted tachometer, encoder, or resolver and the cost for running the leads back to the controller. In many installations these costs can account for 20 to 30% of the system installed cost. DTC technology will also eliminate the need for additional parameter adjustments such as torque boost or starting mode selection such as "flying start." This feature is needed when an inverter powers a fan or pump that may be rotating in the reverse direction when forward power is applied. AC drives with DTC are ideally workable for higher performance applications - many of which have traditionally been powered by dc drives - such as extrude- POWER TRANSMISSION DESIGN n FEBRUARY 1995 51 ers, large cranes and hoists, elevators, centrifuges, paper making machines, corrugators, printing presses, packaging machines, textile ranges, paper film and foil converting lines, and other applications with similar requirements. However, ABB points out that there will always be some special applications where more accuracy will be needed. For these, using an encoder with a DTC drive will increase the speed-control accuracy. Thus, open loop DTC will not be suggested for robots, machine tools, and machines handling fine fibers. The ac drive controllers using the DTC technologies will be available later this year. The first units will be single-quadrant designs - motoring in one direction. Later in the year, four-quadrant units will be in production. These will offer motoring in both directions and the ability to regenerate power back to the ac power line.